This painting arrived to Sherman Art Conservation with major tears in the canvas, actively flaking paint with losses and a discolored varnish with a hardened grime layer. 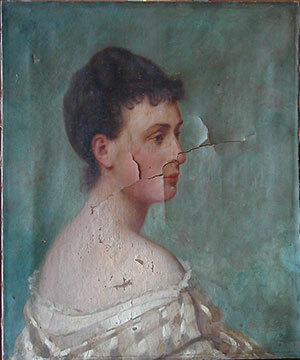 As much of the damage ran through the facial portion of the portrait, the owner was concerned that excessive retouching might be required which would alter the painting. 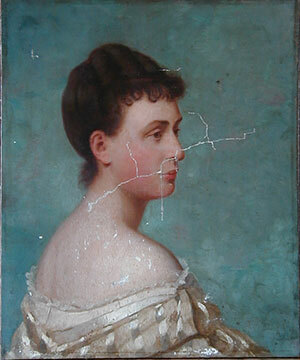 However, In a proper conservation treatment, once tears are mended, very little retouching is actually required. 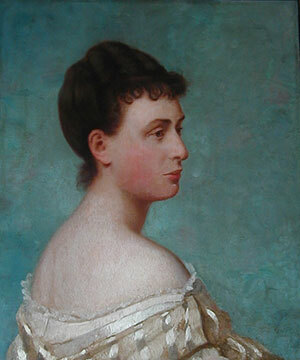 This is the painting after cleaning and lining, prior to retouching. Note how little actually has to be retouched once the tears were joined. Replacing missing areas of paint, consists of two steps. The first is filling the missing area of paint with a material which is then sculpted to imitate the surrounding painting surface. Various spackles and putties can be used for filling. Inpainting (the proper term for retouching) should always be limited only to areas of loss or abrasion. The goal of inpainting is to make the painting image unified. It is not the goal of the conservator to change or improve the artist’s original intent. It is important that inpainting is executed with paints that will not discolor and that will always be easily removable by a conservator in the future. For this reason resin-based paints are used which have been specifically developed for use in restoration.